Jon Snow lives and the episode was aptly called HOME! It had some interesting elements this time (yes,yes I know they always have! ), still I could relate to the feeling of Bran Stark being home and wanting to stay on a little longer too. Wait!! Don’t stop reading! There’s more for people who do not watch Game of thrones(Really now, what made you not watch it?). So as I was saying, being home is such a sweet nostalgic feeling. It doesn’t matter what land you live in below what alien stars, home is where the heart is. As mentioned in my previous posts, I hail from a place with its bountiful natural beauty, it is etched amidst a lot of greenery and perched upon the prettiest of valleys with unending winding roads leading to this small town. When we drive towards this town from the big city, and we have passed most of the winding roads, there comes this one particular hairpin bend which gives this gorgeous view of the entire town and the memories just hit me like a gush of chilliest wind. The memories pass and I am left with this horrible lump in my throat which I desperately try to push down lest people see me cry like a baby. Yes, being home has that effect on me. And no, it does not go away no matter how old I grow, no matter how hard I try 😊. We go past this bend in the road and I point out to the nook where I once buried a dead bird years and years ago, I point out to the corner where I sat and cried when I scored less in a test paper. How many times, oh how many times I have walked those paths, holding my Dad’s hand and how many times he has told me his story of walking the same path while he was young. It has been a while since I went home, in fact it’s the first time I have been away for so long. I yearn to hear the familiar sound of the creaking front gate when it opens, the sounds of mom cooking in the kitchen. I want to sit on the old bench in the garden and do nothing but remember the bygone days. I want to visit the dear old aunts and uncles and make them retell the stories of the past. And so while I was being glum and homesick today, hubby made me get dressed up to spend an evening outside. That cheered me up a great deal and he says there are prospects of a visit to India soon! Now that’s what I call a perfect end to a blueeeeyy Monday☺️☺️. 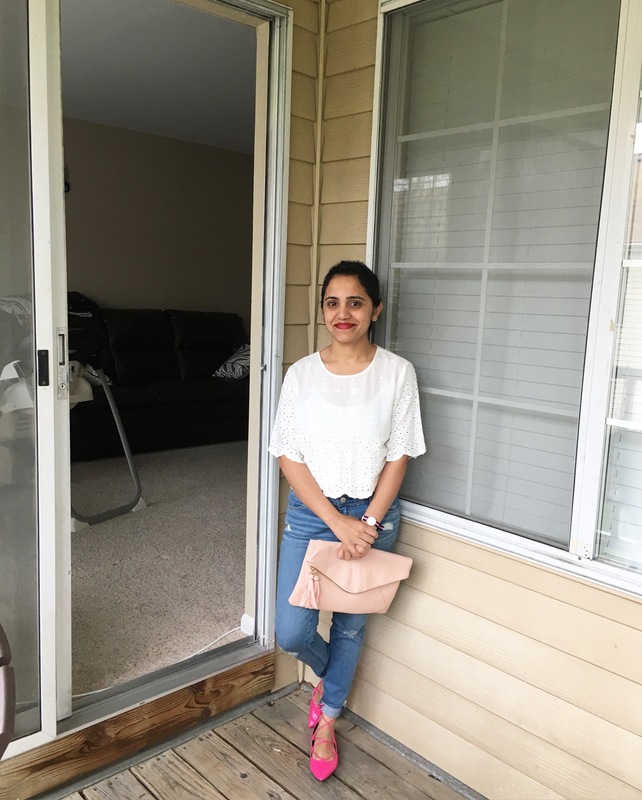 So here is a pic of me embracing the new dream with my latest shopping finds- white top from Forever 21, jeans from Abercrombie and Fitch, oversized clutch from Accessorize and lace-up shoes from Asos. Do let me know your thoughts below and enjoy the week ahead, home or away from home.